Walk into any kitchen and one immediately notices the bling. It’s always in the details and kitchen hardware is no exception. Perhaps it’s been decades since the hardware in your kitchen has had a reboot, your door and drawer baubles are tired and there is no time like the present to take action. When it comes to any renovation, immediate gratification can be achieved with a quick switch of knobs and pulls—the transformation can be swift and budget-friendly. Decide first which design suits your kitchen’s style. The possibilities are endless: whether rustic, modern, simple, or ornate, hardware styles are available in every size and sheen. Keeping in mind other finishes in your room, choosing new hardware for doors, drawers and cabinets can reinvent the space and update its design. Black is back and in hardware exudes elegance and refinement; it’s the little black dress for your cabinetry. To quote Karl Lagerfeld, “black is the color that goes with everything. If you’re wearing black, you’re on sure ground.” The same can be said for your cabinetry accoutrements. Black is the picture-perfect accent for painted and stained cabinetry: the effect of a gleaming white door with a polished black pull is dazzling; a matte black knob on a darkly stained sideboard is handsome as well. Another popular material making a comeback is brass; this time around the metal is finished subtly, with low sheen and subdued warmth, rather than the polished-to-a-shine gold tone of designs gone by. Warm and subtle, matte brass hardware, paired with matte black or dark wood tones, completes the look of cabinets as elegant, rather than flashy; moreover, after so many seasons featuring chrome and brushed nickel, it’s refreshing to see softer brass finishes emerge in hardware, fixtures and fittings, offering new ways to tie together finishes in the kitchen. Mixing hardware is another way to achieve visual interest. Choose a single finish or color and use one pull style on upper cabinets and a different shape or style below. This option works best in larger kitchens with lots of cabinetry; multiple drawers and cabinets allow mixing two or more types of hardware to work beautifully together. Keep in mind the various functions of doors and drawers and pick your hardware according to ease and use of purpose. Also, remember to make selections from the same manufacturer to ensure the finishes match, even when choosing multiple styles. Most hardware comes in classic knob or bar shapes, but there are many options outside the traditional boxed set. Online retailers offer a wide variety of finishes and unique shapes, often including additional materials such as Lucite, stone, glass and even mother-of-pearl. Local cabinetmakers may be able to special order a style and finish not found in the local hardware store basic offerings. Knob and drawer pull placement is as essential as the finish. Form and function are important, but personal preference should trump all else. For accessibility and convenience, knobs are installed with the center of the knob in the corner of the face frame. By this application, the knob is centered in vertically and horizontally. Placing knobs in the corner closest to standing position makes working in the kitchen more comfortable and efficient. Drawer pulls follow the same logic. For a more modern look, though, try installing the knobs and door pulls slightly higher on the upper cabinets or lower on the bottom cabinets, so that hardware rests just past the corner of the horizontal frame of the door. 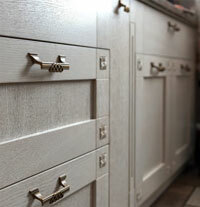 For taller cabinetry and pantry doors, the pulls can be placed midway vertically on the door. 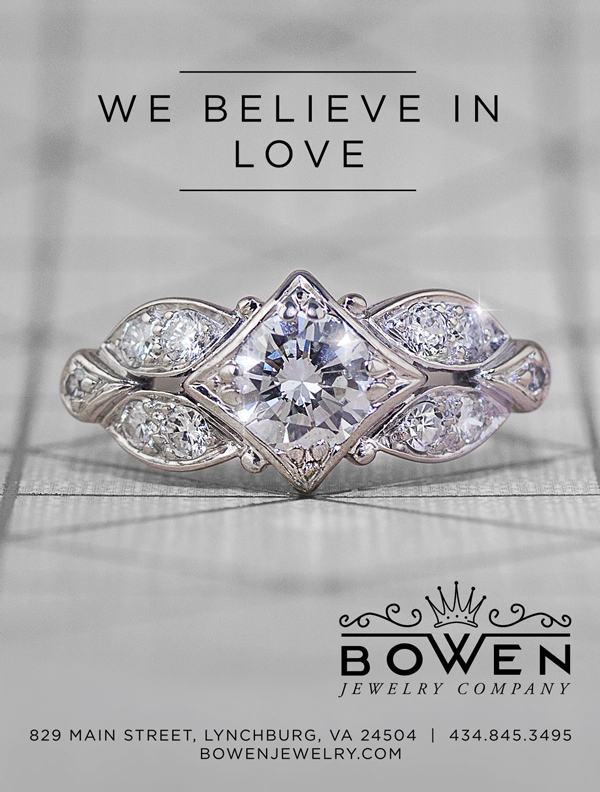 This option gives the piece a more custom and built-in look. Keep in mind, however, that this placement may be more difficult to reach. 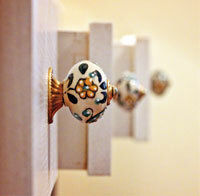 It’s important to consider cabinet style when changing the hardware, but one need not be married to tradition. With a minimal investment, cabinets can morph from staid and conventional, to traditional with a contemporary flair. By adding tubular hardware in a brushed nickel or brass finish, classic shaker style cabinets suddenly become au courant. 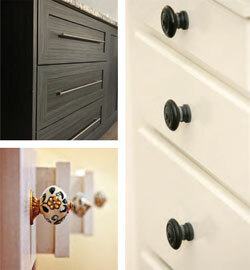 Painted cabinet doors take a turn toward vintage with the addition of faceted glass knobs. Scale is key and finding the right sized pull for your drawer or cabinet door can be tricky. 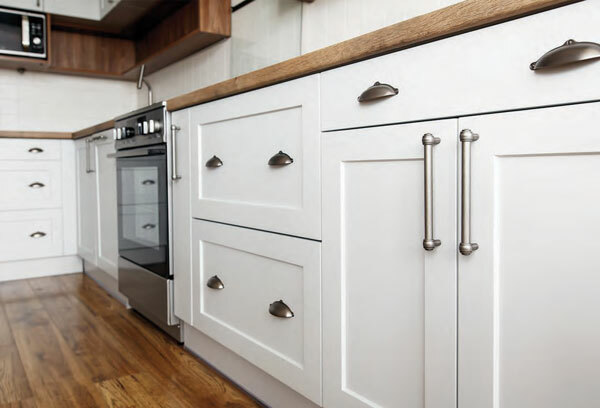 The rule of thumb for cabinet doors is this: for doors, pull length should measure no more than one-third of the height, for drawers no more than one-half the total width. Once the new hardware is chosen, preparation can begin for removing old pulls and knobs. 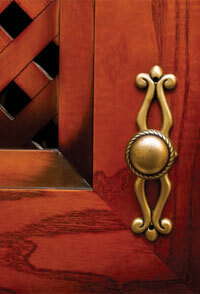 Simply loosen the screws on the back of the door that hold the old hardware in place and remove old knobs and handles. If needed, set placement for new hardware by making a paper or cardstock template to use as a guide for lining up holes. Mark and then pre-drill the holes for the new hardware carefully. Before installing the new handle or knob, fill any holes left by the old hardware with wood putty. Touch up with stain or paint. Once dry and ready, attach the new handles.